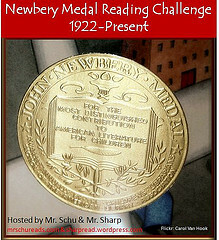 Thanks to an invitation from my building librarian, I presented to a parent book club in my school on Thursday morning. My first talk was on comics and graphic novels. I also shared thoughts and recommendations about Science Fiction. While several parents were nodding in agreement with everything I said, several others are still not sold on the value of this format. I’m sharing my thoughts with the world here, in the hopes that we can make a few more converts. The Prezi I used is embedded below, and includes title recommendations in several categories. 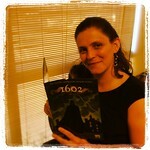 Tomorrow my librarian (aka @ReaderRoberts) is guest posting here about the overall experience of the Parent Book Club. Stories told using sequential art - otherwise known as comics- have had a rocky history. For many years, they were considered the junk food of the reading world. In the past few years, there has been such amazing growth in the publication of this format that I’m sure your students and children have all started clamouring for their own comics and graphic novels. First, let me clear up one point. Graphic novels are not a separate genre. They are just a format - a visual way of telling any type of story or sharing any type of information. My graphic novel shelf includes superhero, science fiction, realistic fiction, historical fiction, history nonfiction, science nonfiction, and more. While I’m relatively new to the format myself, I’ve spent the past two years learning to appreciate comics for what my students can learn from them as well as for their own intrinsic artistic value. I teach students who are, generally, already strong readers. 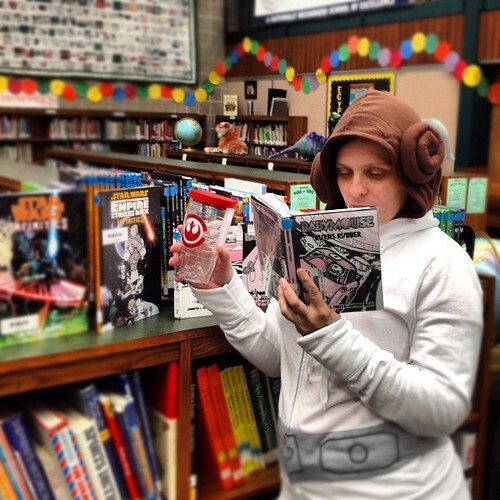 So why would I allow, let alone encourage my students to pick up comics and graphic novels? Here are some of my thoughts, interspersed with some of my fourth grader’s reflections on the question “Why should graphic novels be respected as “real literature”. about women who study primates. “comic” - usually a monthly installment in a story. “graphic novel” a full story told in one publishing, not broken down into monthly installments. Many of today’s monthly comics are targeted to the adult market. If you are looking to buy a subscription to a comic, or are interested in creating a “pull list” for your children, take some time to research the field. There are some wonderful offerings out there for all ages, but you do need to do your research to be sure that the comics you have chosen will fit with your child’s readiness levels. Thankfully, there are some great resources out there to help you find great graphic novels and monthly comics for you and your children. This site is an excellent source of recommendations! Sometimes kids get into a rut in a genre. They may not be willing to invest their mental energy diving into a huge novel in a new genre, but will happily grab a graphic novel from the shelf to give it a try. My students are immersed in western civilization. We study American history to death, but they often have no understanding that there are people out there who have completely different lives and beliefs. Even studying ancient peoples, and helping them take on that alternate point of view, is challenging. So when I can find graphic novels that give them a glimpse into another world, I jump on it. We know that strong readers have mental movies that help them understand and remember what they read. Many kids don't know how to build those visualization strategies, though. Comics are a great way to introduce and/or reinforce this skill. Once students know how comics are structured, they can use that same format to as a way to share their own understanding of the text. As my student describes above, graphic novels are a great way to build vocabulary. Since there are images to fall back on, students can learn new words through the story. Re-reading text is another important skill, but many students are reluctant to reread longer novels. Comics can help them tackle this technique, and students can discover new aspects of the story and art each time. Art is just as important as story. Comics deserve a place in any art history course, and can be used to teach students about color, white space, perspective, and more. Many classics in literature have been adapted for the graphic novel format. Sometimes this can help students access a story they aren’t ready to read in full novel form yet. Sometimes it may help give them the framework for the story, so that they can then successfully read and comprehend the full novel. There is also value in students just reading the adaptation, so they have the cultural literacy to help them understand allusions to those texts in other books and movies. 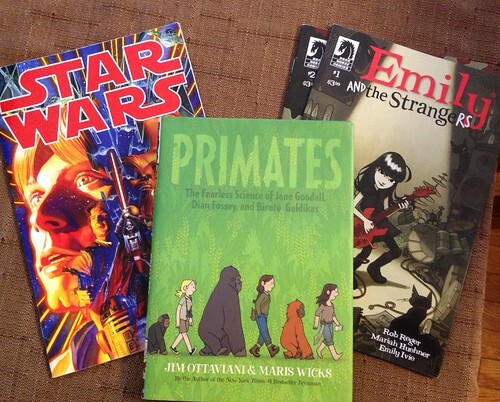 Comics and graphic novels are wonderful part of any healthy reading diet. Dive in! Please feel free to share this presentation with your students, parents, and teachers. I tried to keep it short and simple. What other benefits of comics do you talk about when you share with parents and staff?